We compared root responses to spatial heterogeneity of Zn and Ni in Thlaspi caerulescens J. and C. Presl from normal (NM plants) and metalliferous soil (M plants). We investigated whether the strong metal accumulation capacity of NM plants (compared to M plants) was related to a greater capacity of roots to grow towards metal-enriched soil compartments. Two similar experiments were conducted in summer (slow growth) and spring (high growth), respectively. 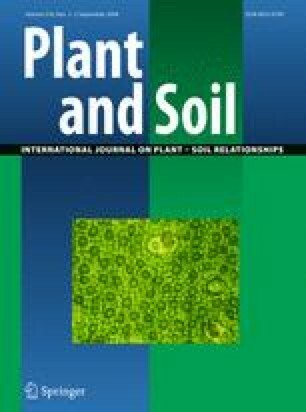 Our study is the first to show that NM plants of T. caerulescens have the ability to allocate more roots in the Zn-enriched compartment of soil. However, the positive response to Zn by roots of NM plants does not explain their higher Zn accumulation capacity as M plants express a similar level of root allocation in Zn-enriched compartment of soil. In M plants, root response to the Zn-rich compartment appears to be more susceptible to variations in growth conditions. Preferential root allocation in Ni-enriched compartment was consistently found in M plants only, suggesting that Ni supply is critical in their native metalliferous soil. Our study also illustrates bias in the interpretation of root allocation studies using two dimensional boxes, as interferences between root response to metal and root chirality have been highlighted. This research was supported by the Fonds de la Recherche Fondamentale Collective (Belgium) (Project FRFC 2.4565.02). NN and XD are, respectively, research assistant and research associate of the FRS-FNRS (Fonds National de la Recherche Scientifique, Belgium). N.N. thanks the Wiener-Anspach Foundation for supporting her postdoctoral stay at the University of Oxford.